Today is a double feature. Both lovingly brought out on High Quality Blu-ray products by Twilight Time. These two films have never looked any better. Never have sounded any better. Both films shine on Blu-ray. I watched these two together for the simple fact, I saw both on a movie marathon in Knoxville Tennessee. A local theater every Saturday would run older films. You could pay one price and sit through as many that was playing which usually was about 5 films. I attended these Saturday screenings many times and saw many classic films and two of those films I saw was the two I am reviewing. The Quiet American is about an American in a cautionary style tale. It’s 1952 and the place is Saigon. Vietnamese are causing major strikes of military force against the French. Alden Pyle, an American economist working with an international aid organization is smack dab, stuck in the middle as the Communist and the French colonialists clash. He tries his best to win over the Vietnamese people. To make matters worse he takes a young Vietnamese woman who is stuck with a mean-spirited English Newspaperman. This English man spreads lies and seeks revenge by stating that the American is selling weapons to the anti-communists. This is based on the novel by the same title. Written by a wonderful, flawless and amazing author Graham Greene which I highly recommend if you love reading. I have read 6 of his novel’s and each one maintains a brilliance. Starring the one and only true-life War hero Audie Murphy. There is a wonderful cast of actors and actress’ that grace this splendid movie. The one and only star Michael Redgrave. The brilliant Claude Dauphin. The flawless Bruce Cabot. The beautiful Giorgia Moll and Kerima. Also, wonderful character actors. Keep an eye out for the amazing Asian character actor Richard Loo. Loo was truly a one of kind gifted actor that never got the stardom he deserved. He was so gifted. He played a lot of American Films as the Asian guy, or the stereotype that Hollywood thought of the Asian person. His long vast career lasted 50 years. Performing from 1931 all the way to 1982. He left a vast career of well over 100 credits to his name. He will probably be remembered mostly for his character of Hai Fat in the James Bond film The Man with the Golden Gun. Many times, he played an Asian General or Japanese General or simply a bystander. Many times, uncredited but always noticed. He can be seen in 1943’s Jack London, 1944’s The Purple Heart, 1945’s Back to Bataan, 1955’s Love is a Many-Splendored Thing, 1956’s The Conqueror, 1956’s Around the World in 80 Days, 1957’s The Quite American, 1966’s The Sand Pebbles, and so many others. It was great seeing him in this. He was always someone that stood out to me even though many of his parts where small or silent. He just had stardom all over him and it’s a true shame he never got that brilliant stardom he so rightly deserved. Thankfully companies like Twilight Time honor such character actors bringing forgotten films out on high quality Blu-ray. Written for the screen and directed by Joseph L. Mankiewicz. A master of cinema production or writing and of directing. All one should do is look at the amazing films he directed. The 1946 masterly film, Dragonwyck. Also, the mastery of 1949’s A Letter to Three Wives. From 1950’s All about Eve, to a huge favorite of mine 1953’s Julius Caesar. He directed 22 films, 22 films that stand out and are amazing to see in all their differences. What made him so unique is he also wrote many of his films adapting books for screenplay. Also, writing for many other films that he did not direct, such as the screen adaption of the musical classic 1955’s Guys and Dolls. He also was honored with another Twilight Time release The Barefoot Contessa. 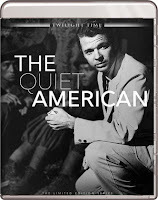 The Quiet American is one of those masterly films that he crafted with his excellence. A little trivia this was also remade in 2002. Same title. I prefer the original, but if you want to see a modern version of the classic story then check it out. Next up is Bridge at Remagen. Starring an amazing cast of performers. Bridge at Remagen is about a World War 2 drama. Now this is based on real life events although the movie is a major fictionalized version of the real happenings. As the allied armies move forward the Nazi’s decide to come up with a strategy to halt the coming armies by blowing up the Rhine Bridge. In the process, it will leave them also trapped on the wrong side. This is directed by a true Master John Guillermin. He is an extraordinary, visionary, talented and brilliant in capturing cinema. This movie is entertaining and is amazingly put together. He directed one of the most stunning World War I saga films The Blue Max which was honored by a Twilight Time Blu-ray release. The Blue Max I think is possibly one of the best flying war cinematography movies ever done. That is something that Guillermin had about his ability of film making, he made you believe his visual stories. He brought you in and made you feel as if true life was happening. He directed some of the great films throughout cinema history like Guns at Batasi (1964), Rapture (1965), Death on the Nile (1978) and he also would move on to direct some of the great B-movies in the 1970s and 80's. Such B-movie classics like Shaft in Africa. The amazing destruction film The Towering Inferno. The one and only remake of the classic King Kong. He always graced cinema with his own talent and his own interesting film vision. The Blue Max I feel was his crowning achievement. 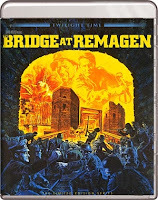 The Bridge at Remagen is also a film that is worthy to praise and write about. Both films look and sound amazing. The sound quality is top notch brilliance. Crisp and Clear. The imagery on both is vibrant, one color and one black and white. Imagery is solid. Both films are spot on perfect. Isolated Music Track with Some Effects: The music was created and flawlessly executed by music master Mario Nascimbene. He was one of the greatest soundtrack composers to ever grace Hollywood. One only must look at his vast career and his ultimate excellence in sound. He, in his wonderful career gave music to over 150 movies, which is unbelievable in the reality of this composer and Conductor. He also was honored on three other Twilight Time release’s Solomon and Sheba, Alexander the Great and The Barefoot Contessa. Isolated Music Track: This is another example of a golden ticket for Twilight Time special features. I am a huge music lover, and something I love is music scores, and that is why I look forward to this special feature. The man behind the music score is a genius of talent Elmer Bernstein. Anyone who is a movie lover should know his tunes. From hundreds, upon hundreds of films and TV. He has given his talent. From the great movies like The Magnificent Seven, To Kill a Mocking Bird, Ghostbusters, The Ten Commandments, The Man with the Golden Arm, The Great Escape, just to name a few. Over 50 years he supplied the beauty of ear candy. Also, he was nominated for an amazing 14 Academy Awards. His music is still being used today on soundtracks. His legend lives on. Twilight Time honored this music master with this special feature, that is a must listen. He had many styles of music in composing, dramatic all the way to Jazz, and so much more. A true mastery that shall never be forgotten. Sadly, he is no longer with us, but his music lives, and this special feature showcases that. Yet again two priceless choices for Special Edition Blu-ray. Each are there own brilliance. Twilight Time has graced two classics with two high quality Special Edition blu-ray’s. Highly Recommended.